Because most of the seafood we eat comes from Baja California (via Catalina Offshore Products), we decided that it made sense to take our inspiration for this year's Feast of the Seven Fishes from south of the border as well. 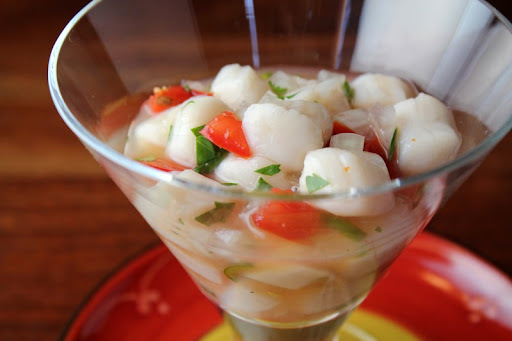 We kept this simple to highlight the lovely sweet flavor of the Bay Scallops - marinated for a few hours in lime juice with onion and Serrano chile and then finished with some cilantro and fresh tomato from the garden (yes, we still have tomatoes growing at the end of December). Cleaned, butterflied and briefly marinated in our "Taco Shop Hot Sauce" before a quick sear on a grill pan. So good. This was our first experience with Bahia Falsa oysters. 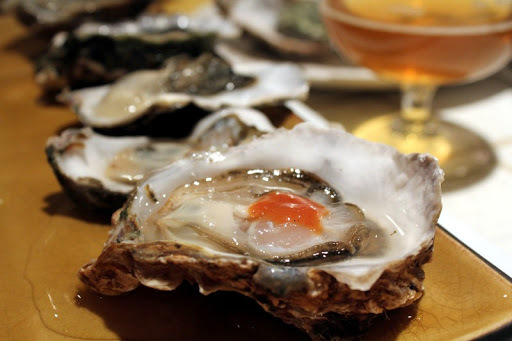 They are a bit on the briny side for me, but I still enjoyed them. 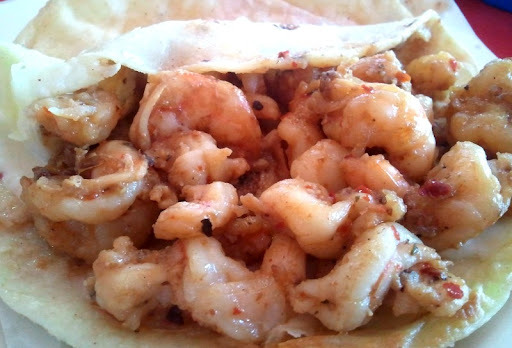 We had some raw (with a bit of Taco Shop Hot Sauce) and some lightly grilled in the shell so that they were just warm, but not fully cooked. 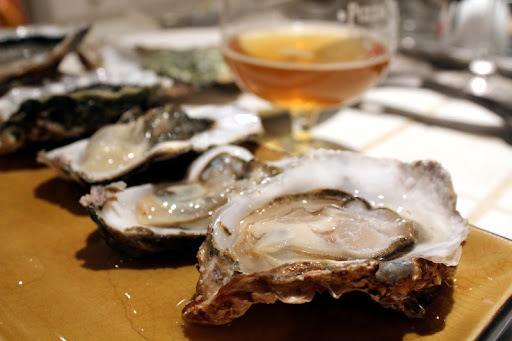 The oysters paired nicely with a bottle of Allagash Tripel. Another simple prep - steamed and then tossed with a sauce of barely cooked tomato, onion, garlic and roasted green chile. 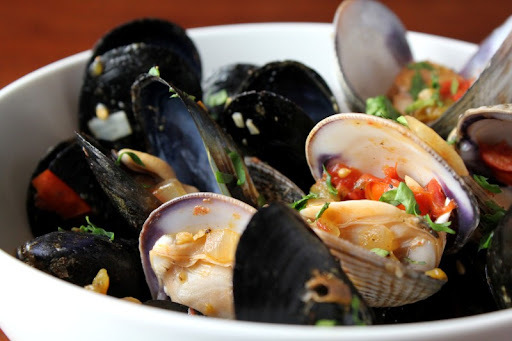 The Venus Clams were particularly nice. Probably the most complex dish of the night. These fritters are made using an egg-based batter much like the coating on a chile relleno, but with the addition of ground up dried shrimp. 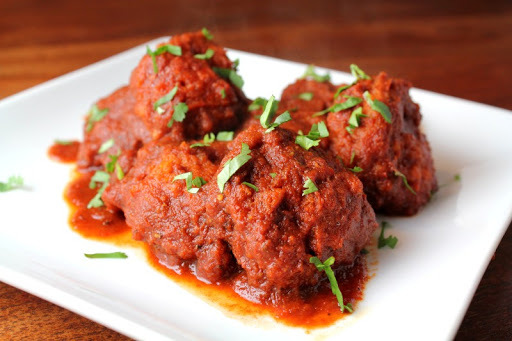 They get deep fried, and then simmered in an earthy red chile sauce. Sherry liked these. I was less keen on them. We finished the meal off with fish and saucy black beans. The fish was two different varieties of grouper. 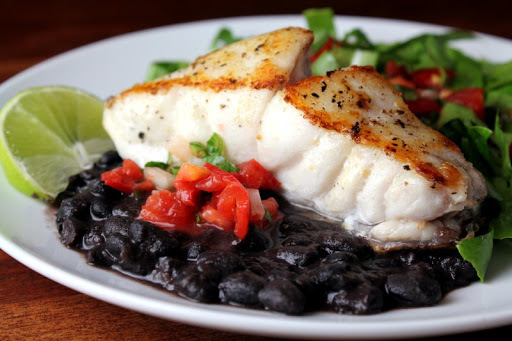 The Cabrilla Grouper pictured above had a meaty, "tastes like chicken" texture. 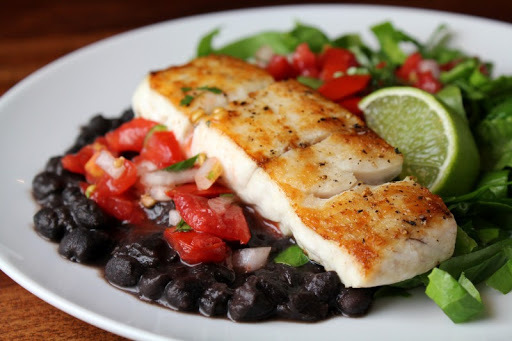 The Baqueta Grouper was perhaps a bit less photogenic, but far and away our favorite of the two fish. It flaked in big, soft chunks and had a beautiful flavor. This year our tally was six dishes and eight fishes. Keeping the preparation simple on most of the dishes helped make it a more relaxed affair than some of our past feasts, but no less enjoyable. We've been on a bit of a Korean food kick lately. 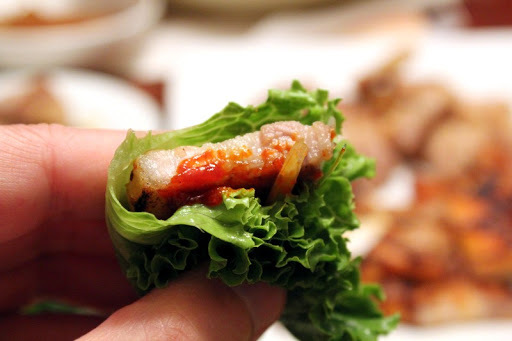 Case in point above, Samgyeopsal - slices of grilled pork belly, painted with Korean chili paste and eaten wrapped in a lettuce leaf with some sliced garlic. 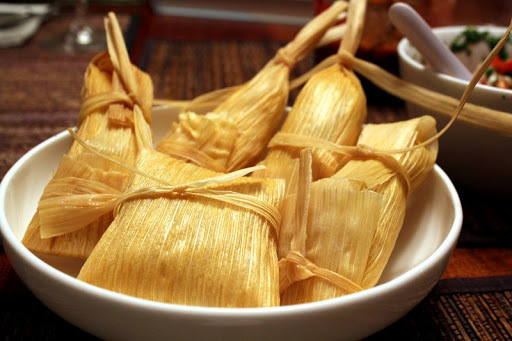 When we make tamales, we do a variety of fillings. Sherry wraps them in different shapes so that we can tell which is which. 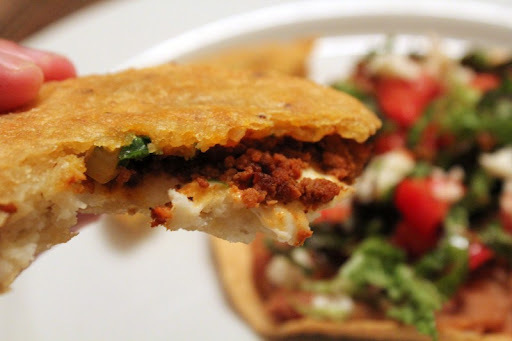 The key to a gordita is that the masa is thicker than a tortilla. 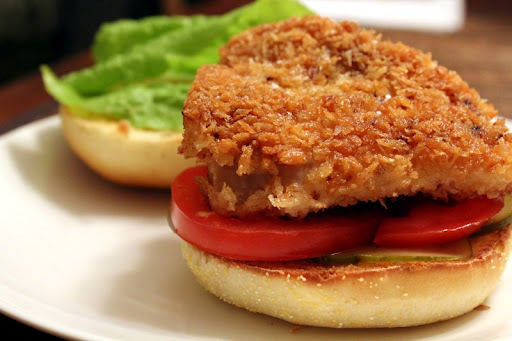 When you fry it, it gets crispy on the outside, but still has a soft texture in the middle. These ones were filled with chorizo and cheese. 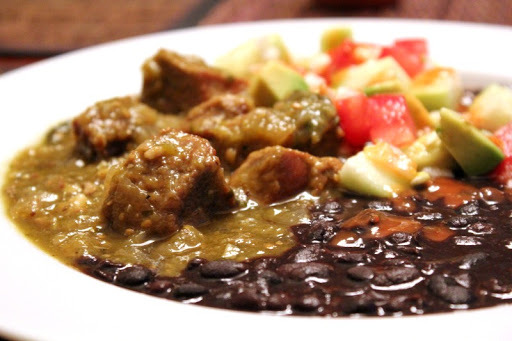 We had this dish when we were in Veracruz, and finally got around to making it ourselves. 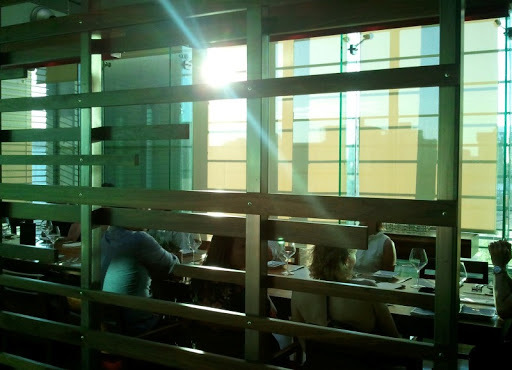 We went down for dinner with a group of like-minded folks and had a really great meal. 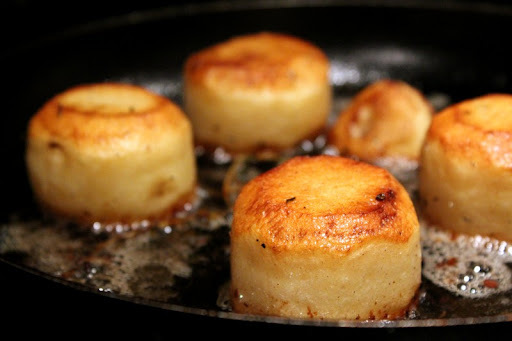 A popular side dish in the UK that you rarely see on menus here, fondant potatoes get browned in olive oil and then get finished in the oven with the addition of stock and butter. 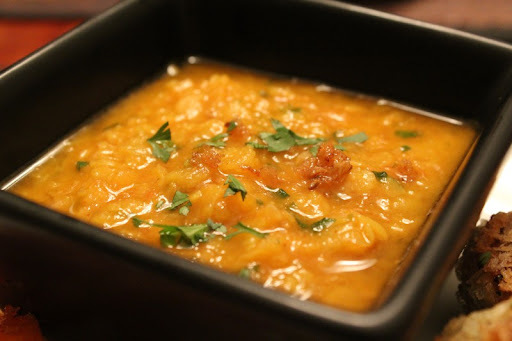 The result is golden on the outside and tender on the inside. Rich and decadent. 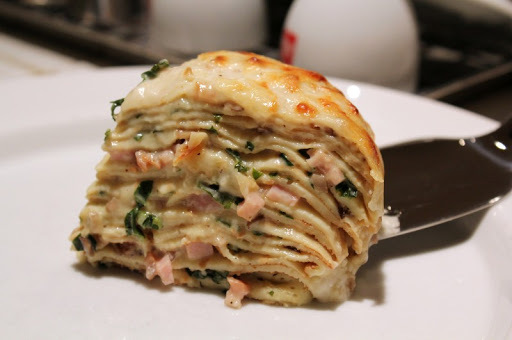 I love the way it feels to take a bite as your fork cuts through the many layers of crêpes. We had a record tomato harvest this year, and gazpacho is a great way to use them when they are ripe. 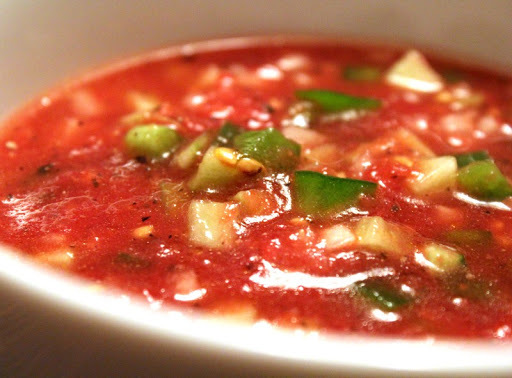 We used to make gazpacho in the blender, but we've migrated to a more rustic, chunky version that we like a lot better. 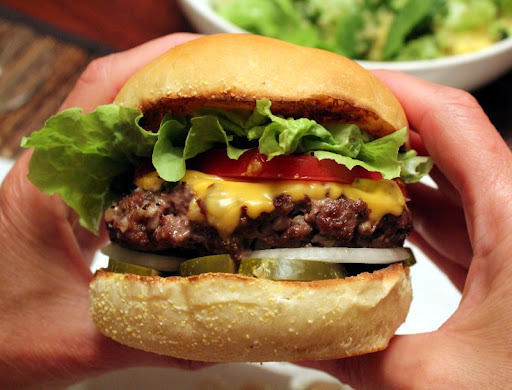 It's been too long since our last food photo round-up and I've got way too many pictures for one post, so I'm going to split this one up into two. 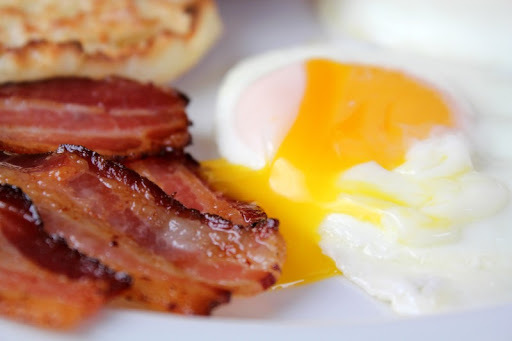 We'll start things off with some simple, but delicious bacon and eggs. A friend of ours now has three yard chickens, and we've been lucky enough to score some of their eggs from time to time. They look beautiful, and taste great. Next up, a favorite snack of ours - memelitas. 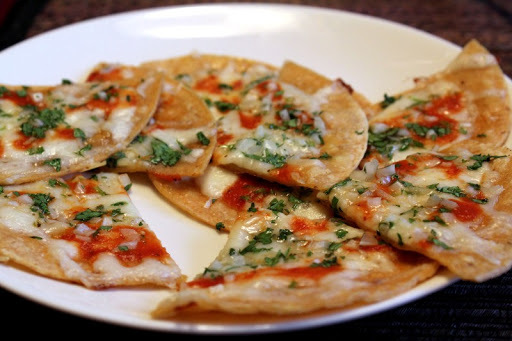 Sherry learned how to make them from our landlady in Oaxaca. 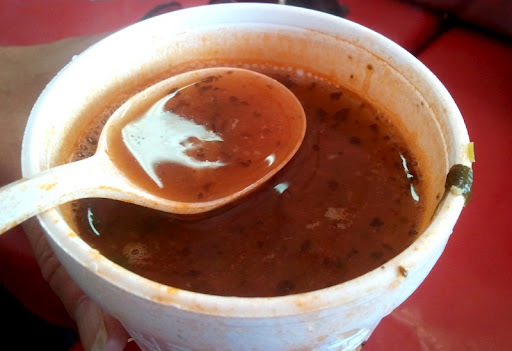 It is a delicious soup/stew (mine usually ends up more of a stew) with an earthy red chile base. I've been playing around with variations and I'll do up a recipe post soon. 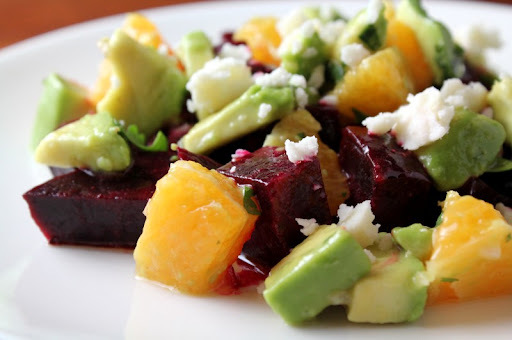 Such rich flavor and vibrant colors. I haven't got it fully sorted out yet, but it is fun to play with. 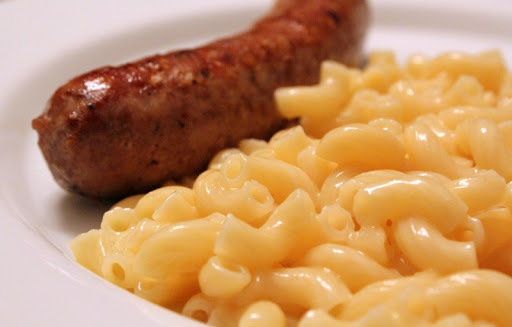 The sausage is decidedly un-"modernist" - a homemade Sicilian sausage, one of our favorite recipes from Rytek Kutas' Great Sausage Recipes and Meat Curing . 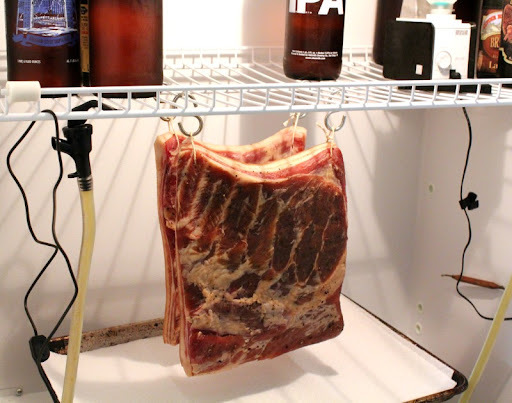 We added a step to our normal process to dry cure it in the magic fridge for a week before smoking. 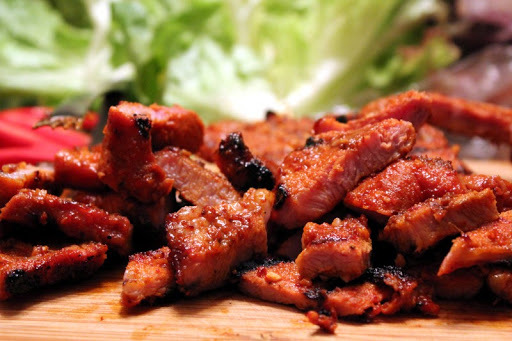 The result was very, very good - a really intense, concentrated flavor and texture. I think it will become a standard practice for us. Phew - that's it for the first part of the round-up. Stay tuned for the next half! 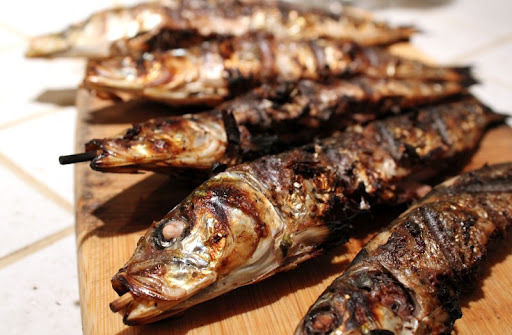 We've been on the lookout for sardines ever since we had them a few years back at Sea Rocket Bistro. 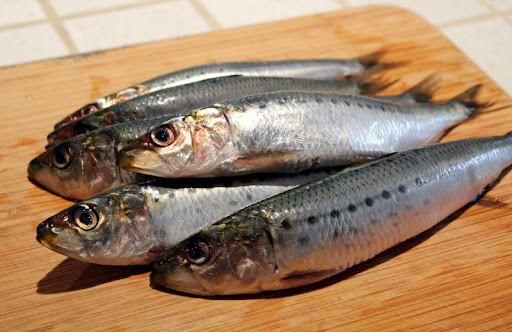 When fresh pacific sardines showed up at Catalina Offshore last week, we jumped at the chance to get some. 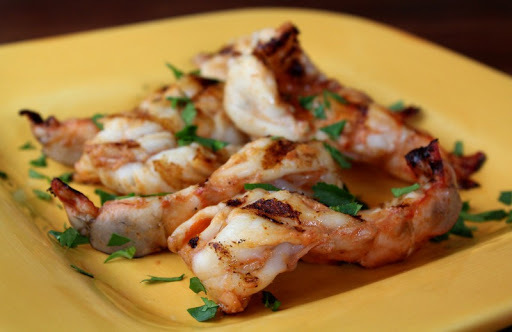 After gutting them (they had already been scaled), the prep was a simple marinade of garlic, lemon juice, parsley, salt, pepper, and just a drizzle of olive oil. 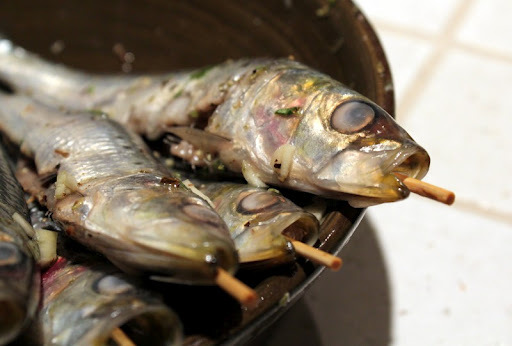 A wooden skewer through the mouth and down the center keeps them flat and makes them easier to eat. 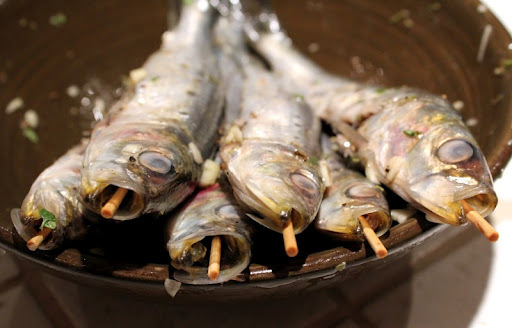 To eat them, you grab the skewer and use a fork, starting just below the head, to peel away the meat from each side. 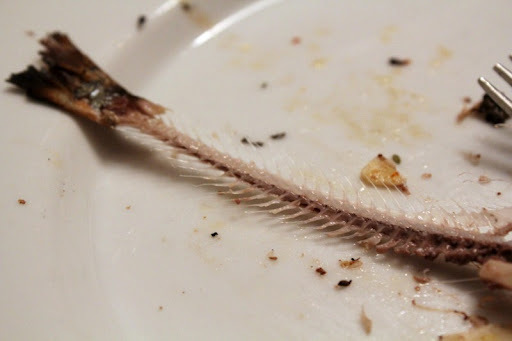 If you do it right, the bones stay on your plate and you get a nice sardine filet. Sardine filet not pictured above because it was in my belly. We like IPAs and we like Saisons, so what would we get if we tried combining the two styles? A very tasty beer, indeed. We used a West Coast style IPA malt and hop profile, but rather than using our typical California ale yeast we used a Saison strain instead. The Saison yeast (we used White Labs WLP568) adds subtle spicy/fruity overtones that work really well with the hop profile. We also experimented with some new (for us) hop varieties in this beer, since our go-to hops (Simcoe and Amarillo) were not available. The "IPAison" has been a really nice summer beer. 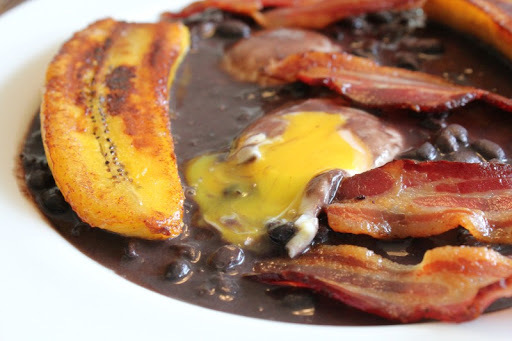 We'll definitely be putting this recipe (or variants of it) in our regular brewing rotation. 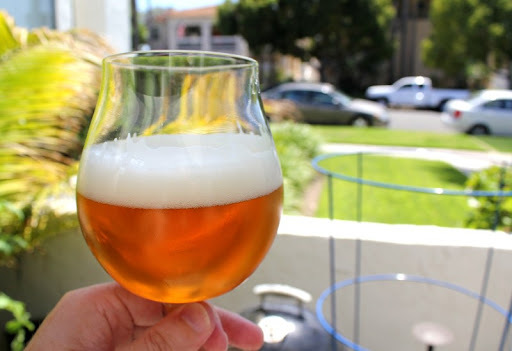 A West Coast IPA brewed with a Saison Yeast. Heat 8 quarts water to 165 degrees for a target mash temperature of 150 degrees. Place the 6 pounds of crushed grain (2-Row Pale, Wheat and Carapils) into a large mesh bag. Pour the hot water into the beverage cooler, then lower the grain bag into the water very slowly, pushing and prodding with a large spoon to ensure all the grain is wet (this can take several minutes). Put the lid on the cooler and allow to rest 60 minutes. While the grains are mashing, heat another 5-6 quarts of water to 180-185 degrees for sparging (rinsing the grains). Near the end of the 60 minutes, heat 2 quarts of water to a boil in your brew pot. You should have about 3 gallons of wort. Bring the wort to a boil and add hops according to the schedule. With 15-20 minutes remaining in the boil, begin adding the DME one cup at a time, stirring to dissolve. At time zero, continue adding DME off the heat until all has been added (if needed, return to low heat for a few minutes to help dissolve the extract). Stir in 1 tablet Whirlfloc. Cover and let sit 10-15 minutes. Move brew pot to an ice bath and cool quickly to less than 80 degrees. Transfer wort to a primary fermenter (straining off the hops if desired). Add water to reach the 5 gallon mark. Swirl vigorously then pitch the yeast. Ferment in primary for 1 week, then transfer to secondary. After 4 days, add dry hops from hop schedule. Bottle or keg after fermentation is complete (2 to 3 weeks in secondary). Here we are again with another look back at some of the fish dishes we've had in the past few months. 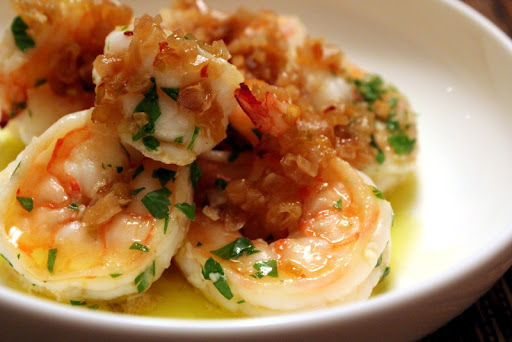 Above is Shrimp al Mojo de Ajo - shrimp in a slowly caramelized garlic sauce. Some bread for dipping is a necessity - you can't let any of that sauce go to waste! We've gotten these Yellowtail collars from Catalina Offshore a couple of times now, and really enjoy them. We give them a quick brine and then toss them on the grill. They taste great and there is a surprising amount of meat on them. 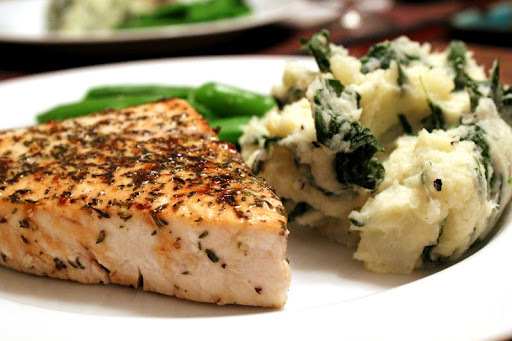 While mediocre Swordfish can be uninspiring, good Swordfish is truly outstanding. 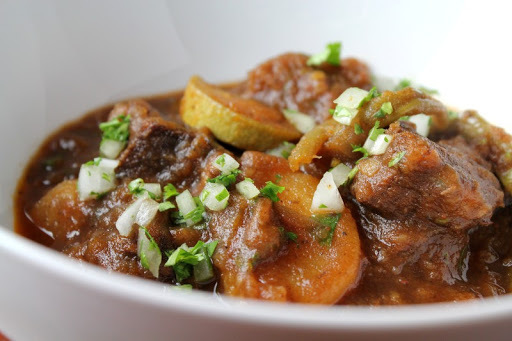 Juicy and flavorful, you don't need to do much to it. This was an experiment that wasn't quite a success. 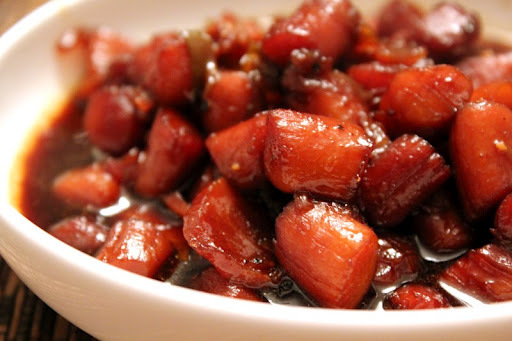 The sweetness of the Vietnamese caramel sauce combined with the natural sweetness of the scallops was a bit much. It was pretty, though! A more successful dish was these Callo de Hacha Scallops (so named because they look like the head of an axe when in the shell). 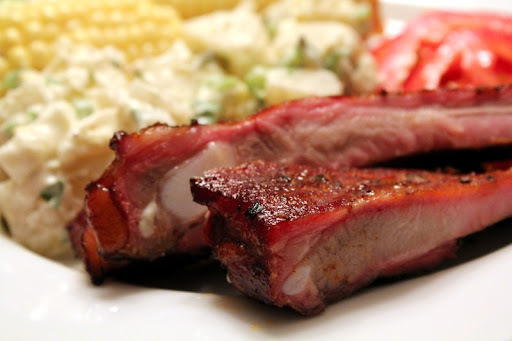 We didn't do much to them, and just barely cooked them through. Fantastic, subtle flavor. 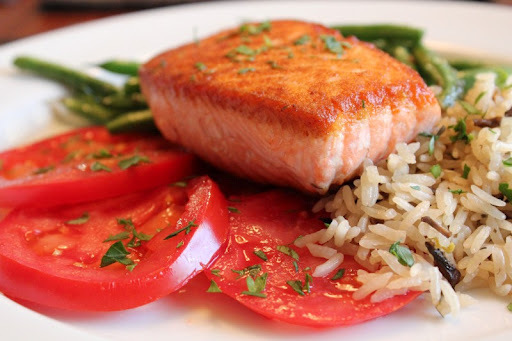 Because we've been trying to eat local fish, and salmon don't grow around here, we haven't had it very much. We really like it, though, so when Catalina Offshore got some in from Northern California we decided that was local enough. I love a good fish sandwich. This one was Black Gill Rock Cod (a new favorite fish of ours), panko-crusted. Don't forget the pickles! We were back in Tijuana this past Saturday for our second weekend in a row. 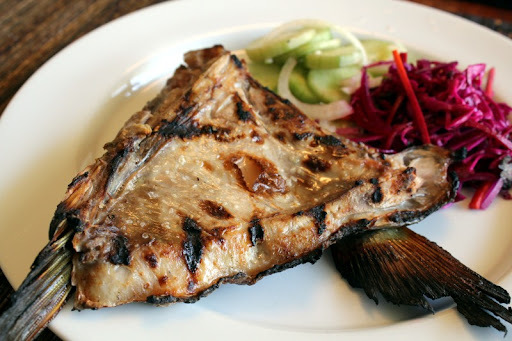 This time we went on a progressive seafood meal organized by Turista Libre and Life&Food. 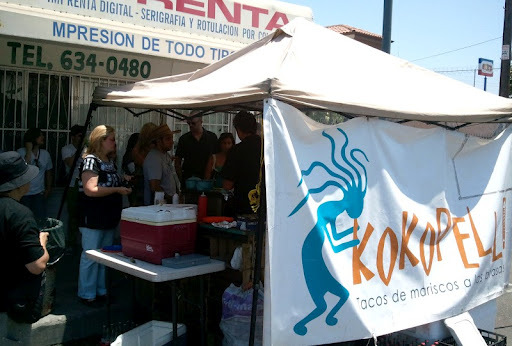 When we ate at the Tacos Kokopelli stand at last weekend's Baja Beer Fest, I thought their name seemed familiar. It turns out that they were our first stop on this trip. Tacos Kokopelli is a little stand in front of a print shop a few blocks south and east of the tourist stretch on Revolución. 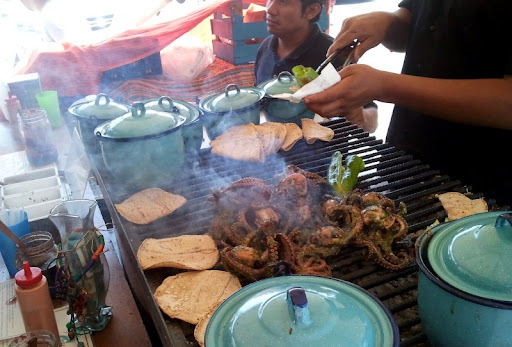 We had two of the same tacos we had last weekend - the "Kraken" (grilled octopus) and the Marlin Pibil. They were even better this time around. We got the octopus served inside a green chile before being wrapped in the corn tortilla. 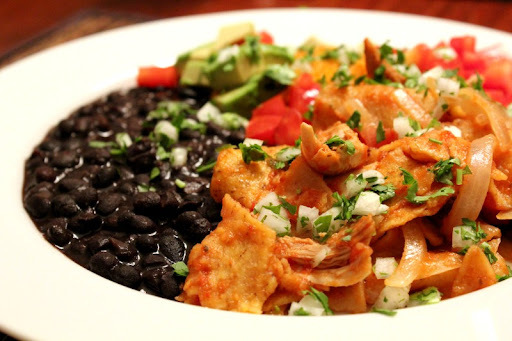 The chile not only adds great flavor, but it also acts as a barrier to help keep your taco from falling apart. 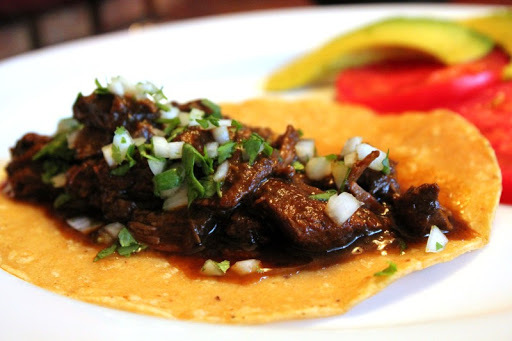 We may have to steal this technique when making tacos at home. 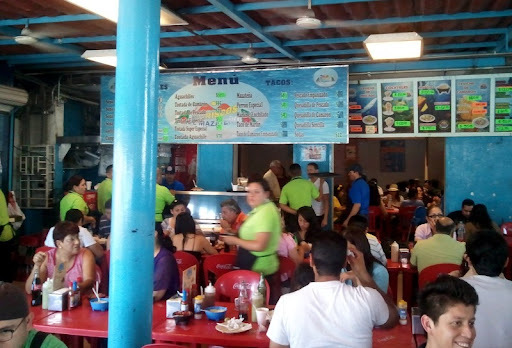 Our second stop was El Mazateño - a Sinaloan seafood restaurant. The place was surprisingly large inside and was bustling with activity. Not overly hot, but very flavorful and a generous portion. We piled them up with the provided pico de gallo, shredded cabbage and sauces and got down to the serious business of trying to eat the tacos before they self destructed. 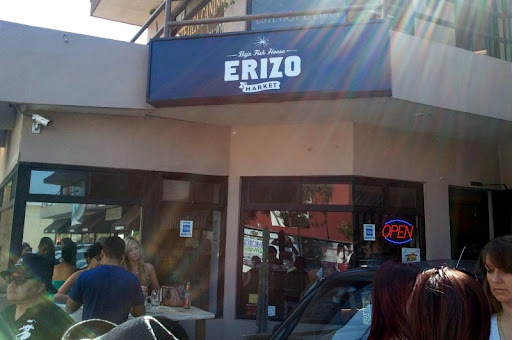 Our last seafood stop was Erizo Baja Fish House and Market - one of the places run by Baja Med restaurateur Javier Plascencia. 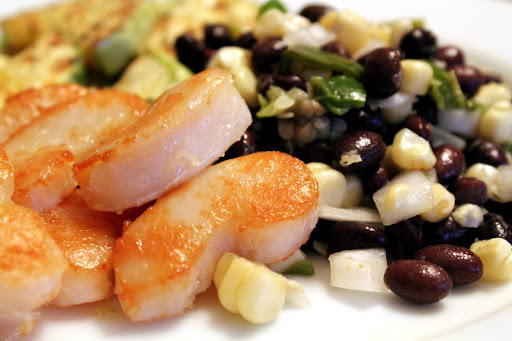 I'm not always a fan of fruit and seafood mixed together, but this tostada was fantastic. 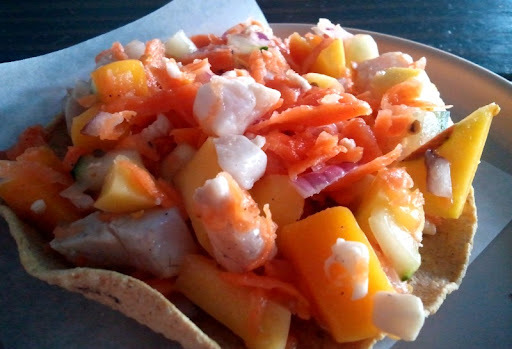 Everything was perfectly seasoned and the brightness of the mango went very well with the fish (a ceviche of Cabichuco - a type of white sea bass). That was the end of the seafood portion of the program - now it was time for dessert! 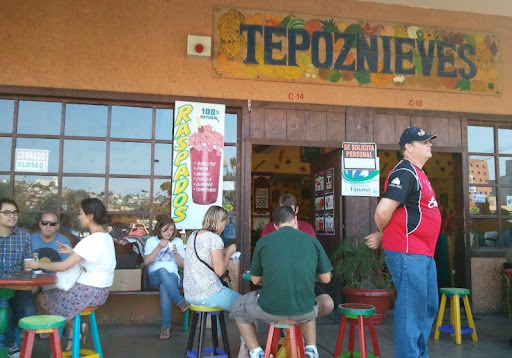 Tepoznieves is an ice cream chain originating in Tepoztlán - a small town outside of Mexico city. 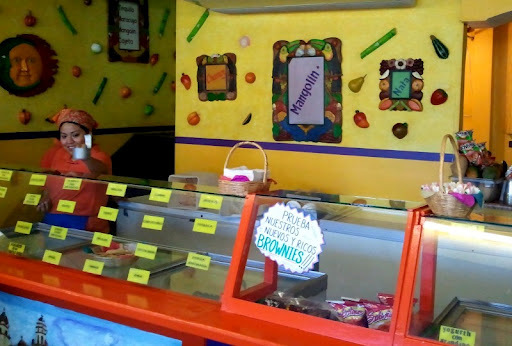 They carry a ridiculous number of flavors - ranging from the standard favorites to the bizarre. My favorite of the flavors I tried was the mangolin (hidden at the bottom of the cup pictured above). 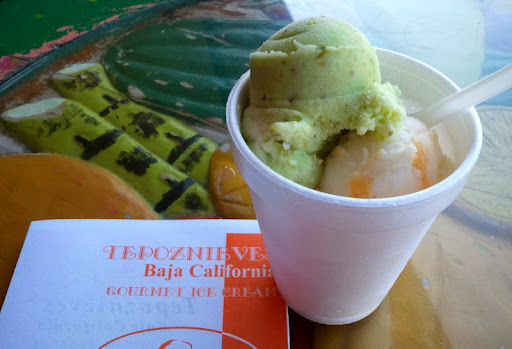 It reminded me of an ice cream version of the fresh mango with chile you can get from street vendors all over Mexico. 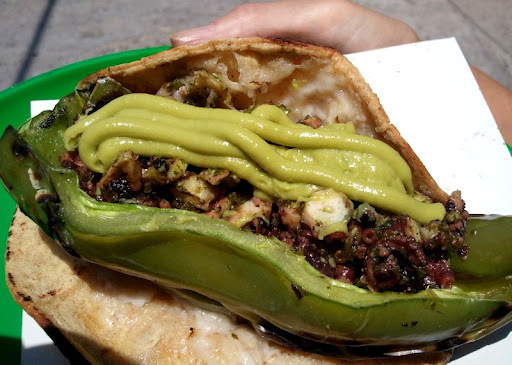 We highly recommend all of the places we stopped on this trip, and more importantly, we recommend that you get yourself down to Tijuana.